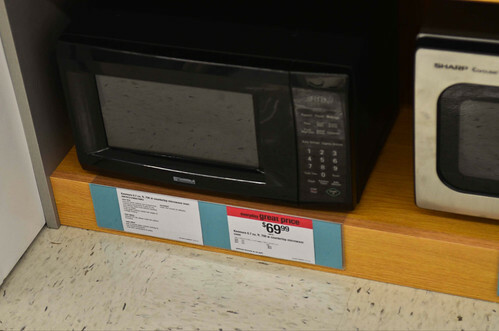 A few weeks ago, I found myself at a local department store looking at microwave ovens. While I was browsing the ovens on sale there, I couldn’t help but notice a few things. For starters, there were quite a few display models of microwave ovens right there at eye level. They had various features – wattage, size, and so forth – and had various prices on them, as you might expect. What was particularly worth noticing is that down by my feet, there were a few additional models. They were kind of jammed in there, without nearly the space devoted to them as the models on top. They also had fairly low prices on them. Ordinarily, I might have ignored these models, writing them off as being generics or poor models simply because of how they were displayed. Instead, I took a closer look at them. It turns out that they were more or less identical to the models that were on sale above. The same brands. The same features. Much lower prices. I went home and did a bit of research, only to find that these models that seemed perfectly fine had merely been replaced by newer models. What had changed? In most cases, very little had changed. The styling of the microwaves changed a bit. In a few cases, there might be a few new programming modes. Very rarely were there any real functional changes when one model replaced another. Mostly, the changes were in the form of non-essential features. Why, exactly, would you want to pay double the price for a couple non-essential features on a microwave oven? Simply put, you wouldn’t. This phenomenon is true with many products you purchase. Why buy a current model year car when you can buy the previous model year for significantly less money? Why buy the shiniest, newest music player when the previous model does the task wonderfully (and for much less money)? There’s only one caveat to this, and we covered it in an earlier post in this series: do the research. It’s always worthwhile to find out what exactly changed between the models. A surprising amount of the time, virtually nothing has changed, but every once in a while, you’ll find a model that made genuine changes (for better or worse) to key features of the item. Being aware of such changes is worth the bit of time it takes to type the two model numbers into Google to figure out what really changed here. If you keep your eyes open for older models, you can often save significant money without losing a single feature that you care about. That’s simply a financial win for anyone.